Big Brain Academy, known in Japan as Yawaraka Atama Juku (やわらかあたま塾), is a puzzle video game published and developed by Nintendo for the Nintendo DS handheld video game console. It was first released in Japan on June 30, 2005, and was later released in North America on June 5, 2006, in Australia on July 5, 2006, and in Europe on July 7, 2006. It has been compared to Brain Age: Train Your Brain in Minutes a Day!. It is marketed under the Nintendo's Touch! Generations brand. 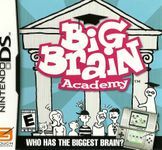 A sequel, Big Brain Academy: Wii Degree, was released on the Wii in April 2007. In Big Brain Academy, tests are done in order to measure a brain's mass. The heavier the brain, the smarter the brain is or the better its reaction time. There is no single game mechanism to Big Brain Academy; as it is an assortment of puzzles with no one puzzle having greater priority than the other. There are three modes of play: Test mode, Practice mode, and Versus mode. As of March 31, 2008, Big Brain Academy has sold 5.02 million copies worldwide. Source: Wikipedia, "Big Brain Academy," available under the CC-BY-SA License.